It was a patient win, but a win nonetheless, as the Tampa Bay Lightning left Texas with two points after a 2-0 win over the Dallas Stars. Andrei Vasilevskiy got his third shutout of the season, only needing two goals of run support while stopping 35 of 35 shots against, including 10 on six power play opportunities for the Stars. 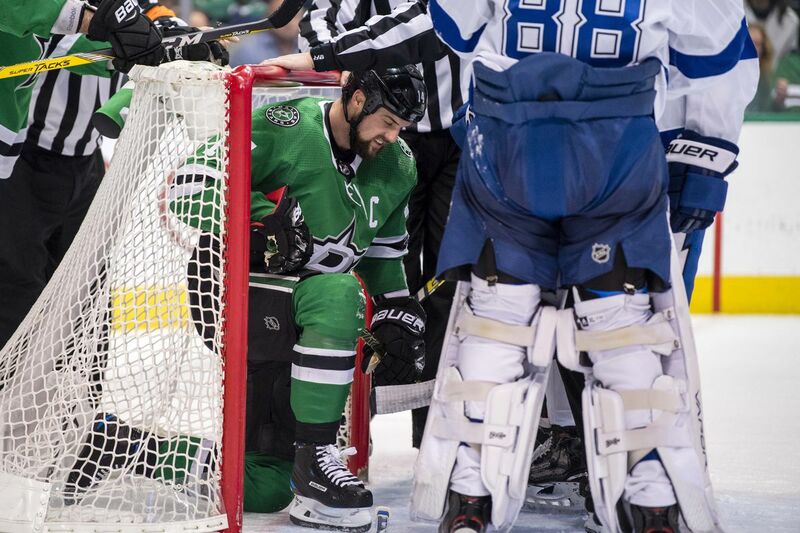 Jamie Benn was the Star of the show for Dallas in this game, but not for the best reasons. He took three shots (and had four scoring chances) while taking two of the three penalties against the Lightning, saving them from a couple precarious situations in the latter half of the game. Speaking more broadly, Dallas’ top four players (Benn, Tyler Seguin, Alex Radulov, and John Klingberg) combined for 32 shot attempts, but only were able to muster one high-danger scoring chance combined. I hope Jim Lites was in the building. Just like most chances in this game, this goal came off the rush. Yanni Gourde got the play started by releasing Steven Stamkos into the offensive zone with a perfectly timed centering pass from the neutral zone side of the blueline. Stamkos then pushed the defense back and set up Ondrej Palat off to his right for a bullet of a one-timer. Simple. Effective. Where was this vs. NYI?? The Lightning had a tentative start to the period, but once Stamkos and Palat broke through the Stars defense, the whole roster got on a roll. After 20 minutes, the Bolts had more shot-attempts (20-17), tied in shots (13-13), but trailed in scoring chances (8-10). The period was an honest, close game between two good teams. It took 30 minutes before the referees called the first penalty of the game, and boy was it something. Victor Hedman got called for holding as he went to retrieve the puck in the corner off a faceoff. As he skated towards the penalty box, Hedman apparently said something in the vicinity of referee Dan O’Halloran, who promptly gave him an extra two minutes for unsportsmanlike conduct. The Lightning succcessfully killed off the first two minutes of the four-minute penalty, but with 70 seconds left in the second, Anthony Cirelli got called for tripping Jamie Benn. As the Stars tried to score on the delayed penalty, Benn decided to go flying into Vasilevskiy, knocking him on his back. He was called for goalie interference, ending any man-advantage on the Cirelli penalty. Vasy was very good during these four minutes down a man. He stopped four shots in those four minutes — including one big chance from in close where he had to squeeze the puck between his elbow and body — with his PKers blocking three more. Stralman was also a horse for the Lightning during that barrage. He played 3:20 of short-handed TOI, all with McDonagh. The Lightning were short-handed for six of those 20 minutes in the second, and as a result, simply couldn’t gain any kind of offensive momentum. At even strength, The Stars had more shot attempts (9-17) and shots (2-8), but the Lightning had one more scoring chances (4-3) in the period. The shot differential definitely looked bad at the start of the second, but after looking a little deeper, it wasn’t as bad. They weathered the storm, which is all you can ask after a period so full of penalties. Mikhail Sergachev got a shot off from the point off a won faceoff by Cirelli and gave the Lightning a two-goal cushion with 10 minutes left in the game. The Bolts were on the back foot for much of the second half, but they took advantage of the few chances they got. Throughout the game, Benn and Dan Girardi were squabbling and sharing shots back and forth. With four minutes left in the game, it came to a head. Benn was driving to the net against Girardi, and as he cut away to go into the corner, he jumped and fell over the pad of Vasilevskiy. Somehow, Girardi was given the tripping penalty. After a heated discussion between O’Halloran (whose name you officially know now), Stamkos, and Cooper, the referee decided to take off the penalty for Gir… what do you mean you’re giving Vasy a tripping penalty instead!? Ugh. Fine. Thankfully, the Lightning killed off that penalty, and then they were gifted a power play of their own (their first of the game) as a result of there being too many men on the ice for the Stars. Too many men by the Stars. I think Khudobin started towards the bench, then stopped, and someone jumped on. Lightning get their first real power play of the game with 2:01 to go. Then things got frustrating and dirty. In a fashion mimicking their CEO, Radek Faksa drove his stick into the face of Hedman (who just came back from a head injury) as the two went into the corner. In his frustration, goalie Anton Khudobin threw the puck into the corner after he touched the puck up to freeze the play. As evidence that the Lightning didn’t like the hit from Faksa, Cooper sent out the top power play unit with a 5-on-3 already up 2-0 with less than two minutes left. Normally, that’s a situation where he would be happy to run out the clock. Instead, he looked to add another goal. And while it didn’t come, it showed how chippy the end of this game was. Anyway, we won. And that’s the best revenge.